City to city or country to country? Contact us to get an immediate quote for your travel plans. Quick and comfortable way to get to your plane or to central Prague. Great value for groups of 2 or more! We know how to cater to the needs of film production companies and other large business clients. We are a privately owned, fully insured and certified transport company. 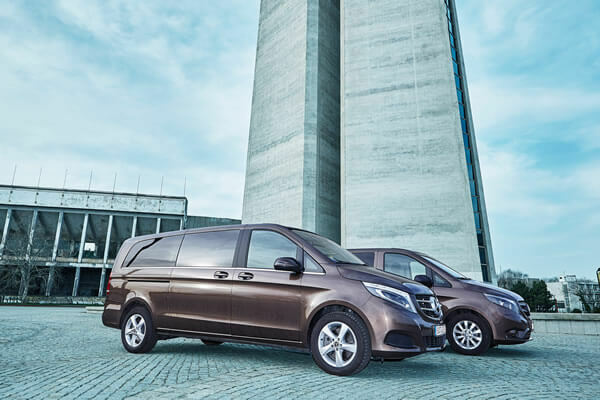 Our experienced and trained drivers use exclusively new Mercedes cars to guarantee the best possible experience on your trip. They all speak English and are ready to help you with all your questions and needs. We strive to provide you with a comfortable, secure service for best price available. Our pricing is flexible to meet all your travel needs. We are more than happy to help you with longer journeys, different destinations and other specific wishes. For a quick price quote and more informations please call or email us. I found these guys online, ordered the taxi from my phone and they were there to meet me on arrival. The driver picked me up in tip top Benz and got me to my destination quick. This service is great because they charge a flat fee. No wondering if the cab driver is going to rip you off or make up some excuse why you have to pay more. The driver was super helpful too. He gave me more good advice about Prague in ten minutes than I found all month researching the city online. Best taxi ride I've ever taken! They are indeed total Transport Artists!!!! This service is super reliable, I use them every time I travel to Prague for business. Eliminates the need to use Prague taxislužba and from Airport. Two thumbs up, definitely recommend! Der Service war sehr gut und zuvorkommend. Jan gab mir auch sehr gute Insiderinfos über Prag. Jederzeit wieder würde ich ihn buchen. During my wife's trip to Europe I found Transport Artist. Was the best option I could have take. They were nice and friendly. The flight was delay and they were constantly in contact with me. My wife was surprised when they pick her up in a Mercedes, and the driver spoke english fluently. I own several apartments in Prague city centre and use this service to pick up my booking.com and Airbnb guests and bring them to the airport for fair price. These guys are very friendly, speak English, always on time and nothing is a problem - even a car seat for children. I am very happy, that my guests start their holiday with such a pleasant experience. Highly recommended company. Transport Artists is probably the best transfer service in Prague. I highly recommend it to everyone who needs to go around the town. We were picked up promptly from Prague airport. The car was very clean and the driver very friendly with great English. He was very polite and gave us great tips on where to eat and drink in Prague. Will use again if return to Prague. Can thoroughly recommend this company that has the most courteous service and cars far nicer than the ones we are used to in UK. Transport Artists have never disappointed. They are always on time, very service minded and the nice and clean cars are a bonus. Will keep on using their services in the future. I have already used this service several times (on my friend's recommendation). Mostly when I leave Prague for my business trips. They are always on time, have great orientation in the city and always very helpful. I would recommend this service to anyone who prefer reliable and classy transport to/from the airport for good price (flat fee) wherever you go. The best transfer service in Prague. Cool guys!!!! I highty recommend it to all traverels to Prague. I use Transport Artist for airport transit mainly during business trips. But I'm so please with their service, I've started using it for all travels to and from Ruzyně. Great value for money! Bokade transport Artists på min senaste resa till Prag efter rekommendation. Bra och snabb bekräftelse. Chauffören väntade på mig vid utgången. Ren och fräsch bil. Super bra med någon som pratade väldigt bra engelska då min kunskap om Prag var obefintlig och jag behövde tips om vart jag skulle ta mina kollegor på middag. Kommer definitivt använda dem igen och rekommendera till andra. Great service without a doubt! The best in Prague, I highly recommend because it is worth it. Friendly and kind which is always very much lacked in Prague! Jan made my experience in Prague very special. Not only is he super knowledgeable of his city, but he is very welcoming to everybody. Highly recommend his services! He will make you're trip one to remember. Very nice cars. Very friendly driver. So nice to have a welcome to Prague with great service like this. I'll definitely use them next time I am back. It is worth taking this company - nice car, friendly driver, good price :) I can recommend this service. I would recommend this transport service to everyone who is looking for a great driver from Prague airport to downtown. The driver speaks very good English and has a great knowledge of Prague. Excellent service, best support, fast and reliable. I can only recommend, Thank you for making our Prague visit so special. Nothing better than getting in a warm, clean and comfortable car after a long trip from Asia. Last time I used them was before Xmas, landed late night, the driver was on time and drove me to my hotel without any hassle. Also helped with my luggage. Great! This has been probably the best taxi with the best taxi driver we have ever experienced. It is not only absolutely reliable, but also very comfortable and affordable. The taxi driver is an extremely helpful and professional young guy, who speaks fluently English. During our short trip from the airport to the centre of Prague, he gave us many valuable tips for our stay there. We are definitely going to recommend this great taxi further. Highly recommended. Looking forward to use their services again. Reliable. Clean car. Perfect service. Jan drove us from Prague to Kutna Hora. He was extremely friendly and gave us all kinds of information about the Czech Republic. The service was top notch and he gave us great advice for local restaurants. Would highly recommend this service to anyone! !